The heart of aikido is: true victory is self-victory, day of swift victory! True victory means unflinching courage. And day of swift victory represents the glorious moment of triumph in the here and now. Aikido is free of set forms, so it responds immediately to any contingency, which thus assures us of the true victory. It is invincible because it contends with nothing. Rely on true victory is self-victory, day of swift victory! And you will be able to integrate the inner and outer factors of practice, clear your path of obstacles, and cleanse your senses. Success comes when both the timing and placing of the blow are just right. But more than this, it happens when the choice of time and target - one's judgement - manages to catch the foe momentarily off-guard, when one has an intuitive apprehension of that off-guard moment a fraction of a second before it becomes perceptible to the senses. This apprehension is a quantity that is unknowable even to the self and is acquired through a process of long training. By the time the right moment is consciously perceptible, it is already too late. It is too late, in other words, when that which lurks in the space beyond the flashing fist and the tip of the sword has taken shape. By the moment it takes shape, it must already be snugly ensconced in that hollow in space that one has marked out and created. It is at this instant that victory in the fray is born. The heart of spiritual mastery is this: the ego self becoming the egoless self. In every martial and cultural art free expression of self is blocked by one's ego. In the Way of swordsmanship the student's mastery of stance and form must be so total that there is no opening (suki) for the opponent to enter. If an opening does occur, it is created by one's ego. One becomes vulnerable when one stops to think about winning, losing, taking advantage, impressing or disregarding the opponent. When the mind stops, even for a single instant, the body freezes, and free, fluid movement is lost. In my opinion, at least, the splendid achievements of Alexander are the clearest possible proof that neither strength of body, nor noble blood, nor success in war even greater than Alexander's own - not even the realization of his dream of circumnavigating Libya and Asia and adding them both to his empire, together with Europe too - that none of these things, I say, can make a man happy, unless he can win one more victory in addition to those the world thinks so great - the victory over himself. their own bodies and souls. I have written before about the good points and the bad points of looking at aikido as a sport in Competition in Aikido and Budo. The other day I was surprised to find a Japanese book called Winning Aikido. It is a striking title. In traditional aikido there is no competition. No victory. No winning. No losing. No winner. No loser. So winning aikido is an oxymoron. Contradictory words used together. 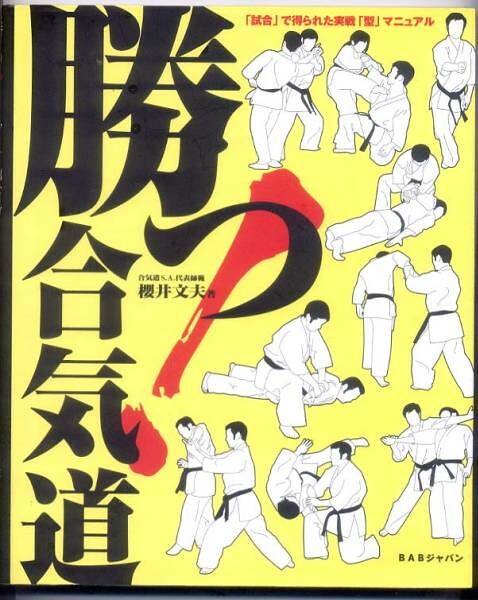 The title in Japanese is Katsu Aikido. Japanese people like to play with puns and homonyms. Breaded pork cutlet is katsu. Short for katsuretsu. So sports players before an important game or people taking exams might eat meals like katsu bento. Winning box lunch. The Japanese sword was a perfect killing tool. But the samurai were influenced by zen. A katana was not only seen as a weapon for killing or cutting an opponent. It was also seen by the greatest masters as an instrument for cleansing or purifying. The sword-blade was supposed to cut away all your selfish parts and evil parts. You excised the enemy within you. The popular actor who played the blind swordsman Zatoichi for many years was called Shintaro Katsu. I wrote about him in The Blind Swordsman. So Win was his stage name. In all his swordfight scenes as Zatoichi he never lost. Niall Matthews lives with his family in Japan. He teaches aikibudo and community self-defence courses and has taught budo for twenty-five years. He was the senior deshi of Kinjo Asoh Sensei, 7 dan Aikikai. He was the exclusive uke of Sadateru Arikawa Sensei, 9 dan Aikikai, at the hombu dojo in Tokyo for thirteen years until Arikawa Sensei's death in 2003. He has trained in several other martial arts to complement his aikido training, including judo (he has 4 dan from the Kodokan in Tokyo), kenjutsu (for about ten years) and karate (for about three years). He originally went to Japan as a staff member of the EU almost thirty years ago. He received 5 dan from Arikawa Sensei in 1995. This 5 dan is the last aikido dan he will receive in his life. His dojo is called Aikibudo Kokkijuku 合気武道克輝塾. Arikawa Sensei personally gave him the character for ki in kokki. It is the same character as teru in Sadateru - not the normal spelling of kokki 克己. It means you make your life shining and clear yourself.